There’s something about a camera that gets children excited, especially if they can take pictures of themselves. In fact, I recently found about 40 nearly identical selfies on my iPhone camera roll that my five year old had taken of herself when I wasn’t looking. But what if your kids didn’t have to stop at simply snapping a picture and filling up your camera roll? 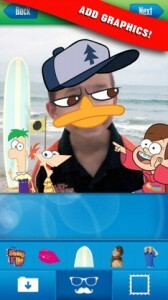 Disney Channel Photo Finish is a brand new app, released on May 30th, that allows children to take a photo within the app and creatively edit it with lots of exciting tools and stickers. Apply filters to make photos black and white, sepia, and more! Disney Channel Photo Finish is a free download that is based on the ‘freemium’ model. While the app comes with a “starter pack” of stickers, parents can purchase other sticker packs to expand their child’s collection. Extra sticker packs include characters from Disney Channel Shows such as Teen Beach Movie, Shake It Up, Gravity Falls and Phineas and Ferb. If your child is a fan of Disney Channel shows and would love to decorate their very own Disney-themed photographs, click the Apple iTunes App Store button below to download the Disney Channel Photo Finish app for free.